The Louvre announced last year that the world’s most famous painting, Leonard Da Vinci’s Mona Lisa, will finally be getting a room all to itself within the Museum. For now the painting is hung in Room 6 on the first floor, the Salle des Etats, and as you walk through the Museum it’s easy to find – just follow the crowds. The mystique that’s built up around it is amazing. It’s a must see for everyone and anyone visiting Paris. Eiffel Tower, tick, Champs d’Elysee, tick, Notre Dame, tick, Mona Lisa, tick. So, why am I banging on about the Mona Lisa? It’s magnificent, one of the greatest paintings of all time. Hugely colourful, greatly detailed. Worth spending time with. But most people don’t. They miss it altogether as they speed through the room - Mona Lisa, tick. It’s a perfect example of something being hidden in plain sight. And a perfect metaphor for what happened at Cana. In Chapter 1 of his Gospel John has been setting the scene for Jesus’ early ministry and giving us some idea of who Jesus really is. Then Chapter 2 begins with ‘On the third day...’ and we immediately sense that something really special is about to happen. That’s because of the significance of the third day in the other Gospels, though not in John, to the resurrection. The story that follows is simple, and familiar. Jesus is a guest at a wedding; we don’t know whose it is. It’s an insignificant wedding in an insignificant town. Jesus is probably only there because his mother has been invited and therefore he goes along, with his disciples, to keep her company. The wine runs out, and everyone looks at Jesus. ‘Why look at me, it’s not my concern’, he says. But his mother’s not convinced. She tells the servants to do whatever Jesus tells them. A bit bossy, but mother’s can be like that. We know the rest. Six stone jars (twenty or thirty gallons – a huge amount of wine, in wine terms an amount equivalent to Veronese’s vast canvas). Water turned into wine. And not just any wine. The best wine. And everyone enjoys this good wine. It’s a wedding after all. And then afterwards Jesus goes off to Capernaum with his mother, his brothers and his disciples. This is the first of his signs, his first miracle. I’m sure Jesus’ mother (John never names her as Mary) and the disciples work it out very quickly, as they recognise his glory and believe in him. This miracle was taking place in plain sight, in front of everyone but only the few in the know, the few who knew which way to turn, could see what was happening. The rest were oblivious, drunk with the new wine, blinkered like those who speed through Room 6 having ticked off the Mona Lisa. This wasn’t just any miracle, if you can say that about miracles. This was the first one, the first sign to the world, but it was only a sign for those who were looking for it. What did they make of it? Well, they didn’t have the benefit of the hindsight and the insight that we have. We can put two and two together; we can look back and think about it. We can even spend time with Veronese. 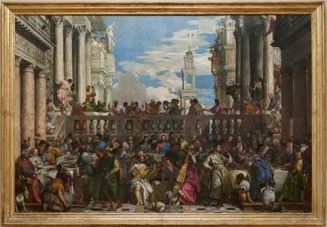 Despite Jesus being peripheral to this wedding Veronese puts him right in the centre, presiding over it in a mirror image of the last supper - ironically, of course, the subject of another of Leonard Da Vinci’s greatest paintings, the same Leonardo who is being revered on the opposite wall. The wedding took place on the third day – the day of the resurrection. Jesus is providing his people with good wine, new wine, his body, his blood. This is prefiguring the Eucharist, the gift of grace for all which Jesus leaves behind as a perpetual memory of his life on earth and his continuing presence with us. We know that now. But then it was just the best wine ever. Jesus performed a number of miracles after this, including another one at Cana. What they have in common is that they are all relatively low key and focus on the people immediately around him whether they be friends, family, followers. He feeds people, he heals them, he meets up with them, returns to them and greets them, he brings them back to life. This miracle strangely enough is quite run of the mill. It doesn’t meet a desperate human need rather it averts an embarrassing social mistake. It’s more about etiquette than enlightenment. And yet it’s that very mundaneness that makes it stand out. If we’re surrounded by tumult and thunder and lightning, gongs and symbols, another unexpected crash is entirely expected. But this is done in the quiet, almost in secret, with no-one really paying much attention. And the ones who understand are those who have looked and paid attention. Jesus miracles are not large scale, not overly dramatic, not crash bang wallop. He doesn’t water the desert, he doesn’t destroy the temple, he doesn’t turn back mighty armies, he doesn’t pervert the laws of nature in such a way that they can never be restored, he doesn’t contradict the flow of creation. He just does enough for his purposes. He could do more. For God nothing is impossible. But God, God in Jesus, does not intervene where he does not need to do so. This is God’s world which he has shared with us. It is as he wants it to be. He is not an interventionist God. He is not armed with thunderbolts ready to take out those who disagree with him or anger him. When Jesus performs a miracle it is not designed to bring about tumultuous change in the natural world. The object of the miracle is not here the water that changes into wine. This is simply a means to an end. The focus of this miracle is the disciples. What is important here is the effect that this transformation has on them, that they see his glory and that they believe. And this miracle has a greater meaning, as Veronese understood, and as it’s open to us to understand in pointing us forward to the ultimate miracle of Jesus’ passion and resurrection. Jesus’ work is designed to help the disciples to believe and to do this by making belief an attractive proposition, something they want to do. Belief is not something he wants to force upon them. He could. He has the power. But what would be the point? Belief should be arrived at willingly, not through coercion. They have to work it out for themselves. They have to turn around and be attentive, take notice. Their willing belief should be the mirror of the grace that God provides for all of us. The disciples are the ones chosen by him, quite precisely, as his agents to carry on his work. If they do not believe they cannot be successful, and if they are not successful then Jesus’ mission, God’s mission, is doomed to failure. What is it that we can take from this? We are his disciples now. We need to accept that God will act in the world, that God does act in the world. But we also need to accept that God’s actions may not always be obvious, in your face. Don’t misunderstand me, this is a big thing that Jesus has done. Turning water into wine is not normal. But this wasn’t the obvious thing to do. Do we expect God to intervene and guide our lives? Do we wait for the dramatic intervention that will transform us? Are we shaped by God into his image as he lays down a blue print for our lives? That’s one view. But an alternative is that we don’t wait, that we search out God, actively look for Jesus in the everyday, the mundane, not expecting drama, not requiring transformation. That we shape our own lives in our understanding of what God wants us to be. What we have to accept, I believe, is that if we hang around waiting for God to make a big statement in our lives we might wait around for a long time, too long in fact. If I spend my life looking at the Mona Lisa then I’m in danger of ignoring what is going on behind my back. I need to be curious about what is around me, about the world. Sometimes I need to just look around me, see the huge canvas on the other wall, the painting that reveals it all the truth hidden in plain sight. I need to find out where this good wine came from. An everyday miracle. It’s the everyday miracles that matter, that we need to pay attention to. Because it’s the everyday miracles that point us towards what God is really doing in this world, the real miracles that we find in creation and that speak to us in the incarnation. Every Sunday we have access to a miracle hidden in plain sight, the miracle of the Eucharist. Christ is shares his body and blood with us, when we take the bread and the wine they transform us and give us the chance to be one with him. Give us the chance to share in his glory. Give us the chance to truly believe in him. To share in this belief all we need to do is turn to face the right direction, step up to the altar and kneel before him, and once we make that approach and we’ll find Jesus there waiting for us with the new wine.